This weather station is located on Logan Peak in the Bear River Mountains, a branch of the Wasatch Range, and is maintained by Campbell Scientific. 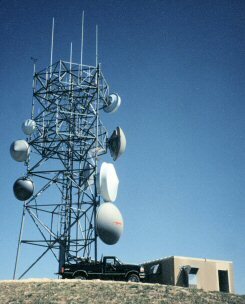 The sensors are mounted among the communications equipment on the communications tower and the datalogger is housed in the adjacent building. Elevation at the site is approximately 9710 ft (2960 m). Logan Peak is approximately 8 mi (13 km) southeast of Campbell Scientific and 5255 ft (1602 m) higher in elevation. On a clear day, the communications tower can be viewed from Campbell Scientific with binoculars. The climate at the site is typical of that found in the high mountains of the Wasatch, with long cold winters, deep snow, and cool summers. The peak is very exposed and therefore is subject to strong winds, especially during the winter as Pacific storms sweep across the area. The strong winds are usually from a southerly direction, but may occur from about any direction, and are usually accompanied by blowing and drifting snow. Most of the summer precipitation comes from brief but sometimes heavy thunderstorms. These are most frequent during late July and August, and generally occur during the afternoon and evening hours (Eubank 1979).